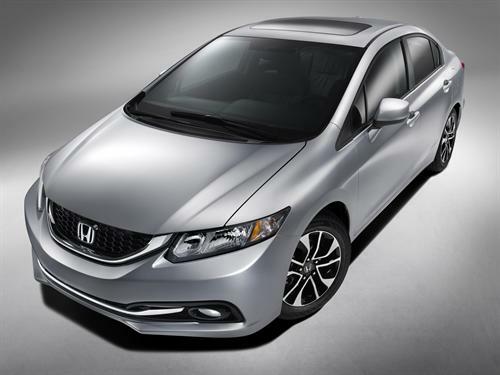 The 2013 Honda Civic Sedan and Coupe are the first small cars to receive the highest available safety rating that the Insurance Institute for Highway Safety (IIHS) offers. The new 2013 Honda Civic Coupe and Sedan were tested by the IIHS for safety, including the new small overlap frontal crash test. The compact cars became the first so far to receive the IIHS' Top Safety Pick+ (Plus) rating and continue Honda's high safety standards by becoming the fourth model in their lineup to receive TSP+. Honda and Acura together lead all other brands in Top Safety Pick choices with all 2013 models tested to-date receiving a TSP or TSP+ rating. The new 2013 Civic is equipped with the Honda Advanced Compatibility Body Structure (ACE-II), now in its second generation, and is also the first compact car to receive the highest possible rating ("Good") on the IIHS small overlap frontal crash test (or narrow offset test). The ACE-II system is designed to handle a wide range of collision scenarios and distribute or absorb crash force to maximize protection for the vehicle's passengers. The IIHS crash tests for frontal assessment now include a head-on, corner (also called a quarter-corner), and the new narrow offset testing. Vehicles are rated on each of these plus other crash test criteria and impact types. The IIHS is the nation's leading private crash test group, representing many of the nation's top automotive insurance providers. Its tests are meant to supplement or enhance ratings given by the National Highway Traffic Safety Administration (NHTSA) in official government safety ratings. The 2013 Honda Civic comes standard with ACE-II as well as Vehicle Stability Assist (VSA), traction control, Anti-lock Braking (ABS), side curtain airbags, dual-stage multi-threshold front airbags, and driver and front passenger side airbags. Additional trim model options offer more airbag protection and other active safety measures. The 2013 Civic joins the 2013 Accord and 2013 Acura TL in achieving the IIHS Top Safety Pick+ rating. Other Honda and Acura models for the 2013 model year have received the Top Safety Pick designation, including the Fit, Crosstour, CR-Z, CR-V, Insight, Pilot, Odyssey, Ridgeline, and Acura ILX, TSX, MDX, and RDX.